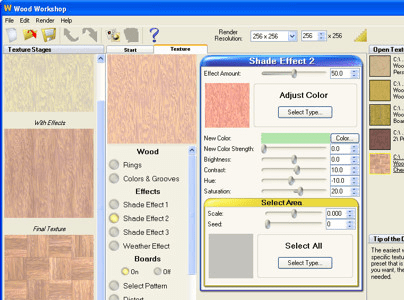 Create an advanced, amazing Wood Workshop on your computer. Creation of wood and floor textures are not limited to the shopfloor now. 3D artists can easily create seamless wood textures online. The tool enables you to quickly create a variety of designs and textures neither restricted to designs nor resolutions. You could also take advantage of the hundred preset textures that come alongwith the tool. These designs are again fully editable. The resolutions can be changed as per the requirement without any updation problems. The number of options to edit and design your floors is limitless. There are over two hundred sliders that you can opt for to generate your seamless wood textures. The rest is left to your creativity. Use it to create texture and floor board designs for walls or floors. You will notice the 3D graphics technology utilized to the utmost in your everyday life.